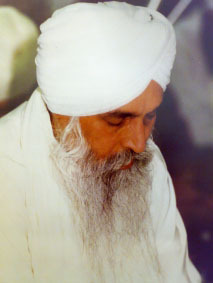 During his lifetime, Sant Baba Puran Singh Ji identified his successor as Bhai Sahib Norang Singh Ji. Born in 1926 in Dhariwal, District Jallandhar in the Punjab, his early years were spent in Amritsar, partaking in sewa at the Golden Temple whilst keeping the company of Sikh holy men. He then moved to Singapore and lived a life of devotion and tireless service in the company of another revered saint, Sant Baba Sohan Singh Ji. From here he moved to the UK, where he met with Sant Baba Puran Singh Ji in 1968. They developed a spiritual bond which led to programmes and events inspiring the Sikh community to see their heritage as a source of strength, this at a time when it was all too easy to give up on their identity and source of belief. Together, they also promoted the principle of Nishkam Sewa, which includes voluntary service with no desire for personal gain. In 1977, the first Gurudwara of the Guru Nanak Nishkam Sewak Jatha was opened on 18-20 Soho Road, Birmingham. This provided a base, not only for service to the Sikh community, but also to galvanise financial support for humanitarian causes, such as the Ethiopian Famine appeal, Bangladesh Flood appeal and the Rwanda Crisis appeal. The Jatha’s support was extended to local hospitals and schools, this included a tour to al the schools in the local area by Bhai Sahib Ji, who personally distributed sweets by hand to each and every pupil. During the economic recession of the 1970s, a co-operative commercial enterprise was set up – Marg Sat Santokh Manufacturing Limited (MSS) as an example of a self-help co-operative to provide employment amongst the community. After Sant Baba Puran Singh Ji’s heavenly departure in 1983, Bhai Sahib Bhai Norang Singh Ji ensured that the high ideals and standards of Baba Ji were strictly maintained, setting an infrastructure and a pace for all Jatha activities within the Gurudwara and beyond. Bhai Sahib Ji initiated and oversaw the building of a Gurudwara at Baba Ji’s birthplace in the Punjab town of Gura, this was followed by the building of a GNNSJ Gurudwara in the historic Sikh city of Anandpur Sahib. Between 1992-1995, over 40 different construction and relief projects in India were funded by the Jatha. Bhai Sahib Ji was particularly concerned about the urgent state of repaid needed on the Golden Temple, Amritsar, after the extensive damage it suffered in the news-breaking army invasion of the complex in 1984 and compounded with the effect of weather and acid rain over the years. The management body in charge of looking after all Sikh shrines in India, the SGCP (Shiromani Gurudwara Prabhandhak Committee), after exhaustive scrutiny and in recognition of its high ideals, strictly non-political nature and excellent record of achievement, bestowed the GNNSJ with the project of restoring the Golden Temple, the project commenced 3 February 1995. This was a historic kar-sewa, or service for Sikh historical site, undertaken by the Sikh Diaspora. Such restoration work, on such a scale had not taken place for over 170 years, on the Golden Temple since the time of Maharaja Ranjit Singh, the Sikh Emperor known as ‘The Lion of the Punjab’, in the first decade of the nineteenth century. Bhai Sahib Ji left for his heavenly abode on 3 July 1995 – five months to the day after commencing the kar-sewa – having seen the completion of work on the exterior of the Golden Temple Dome and having fitted the new Golden Kals (finial) with his own hands. He departed, leaving the Guru Nanak Nishkam Sewak Jatha to continue its activities through the guidance of Bhai Sahib Bhai Mohinder Singh Ji.